The Empire in Star Wars can be accused of many things, but one of them is not uncleanliness – Darth Vader’s cloak is always pressed to perfection and it’s very much to the credit of the Stormtrooper's that they’re able to keep those white uniforms so pristine. Did you ever see a speck of dust on the Star Destroyer? We didn’t. 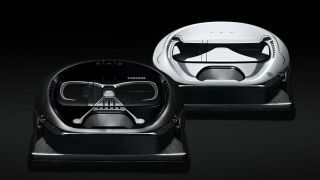 The Darth Vader model will apparently state “you are powerful” when it goes into turbo mode and play the Imperial March when it’s returning to its charging station. Yes, it also does the breathing. Availability is only in the US at the moment but Samsung has said more details on UK availability will be announced in "due course."